We supply Coil Resistance, Joint Resistance Ohm Meter, High Voltage Flash Tester, Insulation Resistance Tester, Water-In-Filter Sensor Checker, Heating Filament Tester, Vehicle Side Mirror Function Tester, Ultra Filtration etc., We manufacture these products with best Industrial standards and also known for its longer life, corrosion resistance, cost effectiveness and reliability. Moreover we make use of good quality material, advanced machinery and methodologies in our production process in order to assure zero defect product. We attained maximum level of client satisfaction every now and then. In order to meet client needs we maintain a healthy relationship with our clients and managed to develop long term relationship with them through our ethical business policies and client business strategies. 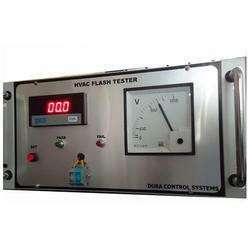 High voltage flash tester is useful for measurement of breakdown in electrical components, insulation of instruments, transformers etc.Ensuring the material can withstand the high voltage stress.To determine and ensure the dielectric strength and dielectric losses of the insulating material. Automatic tripping facility based on the tripping level by adjusting single turn potentiometer. Buzzer and LED indication when tripping. Visual indications for high voltage ON/OFF. I/P Power Supply : 230VAV, 50Hz. Load Voltage : 0-1000VAC O/P. 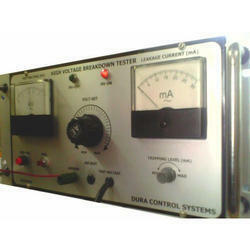 We are presenting a wide range of resistance testing unit for various applications. The range of our product is definetely good in quality and it has been designed based on the application specification. 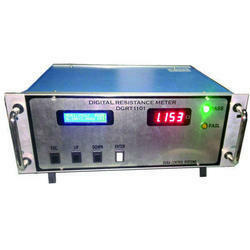 It can measure and test at all ranges from milliohms to megaohms produce an accurate readings. More optimized and it is easy to use. These testing unit are extensively in the market due to their reliablity, accuracy and precision. Best in class industrial grade components and quality.User interface display options both LED and LCD.Easy menu options for settings with password protection.Pass/Fail LED indication with appropriate relay output.Serial Communication RS232 Interface.Digital Input for Start, Stop, Reset.Its works as standalone or PLC interface for automation. Resolution : ±10mΩ.Measuring Range : 0.001mΩ to 5Ω. 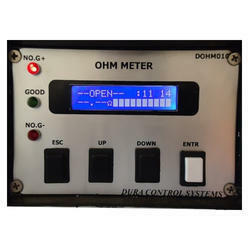 We offer our clients a best quality reliable milli-ohm meter as per the industrial standards since they are capable of measuring very small resistance. It has a clean outlook, well designed internal circuits and simple operation. It is suitable for testing winding resistance of a coil, transformers and other low resistance equipment’s. 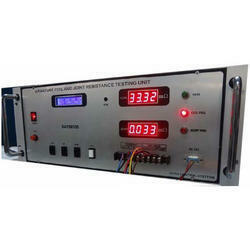 Provided by us is an excellent range of Insulation Resistance Tester at industry leading prices. These are processed by our team using advanced technology and sophisticated machines. We ensure to offer flawless range of products to the customers by thoroughly checking these on various quality parameters. Following are the specifications of our products. Designed to excellence, the products we supply are highly durable and very long lasting. Load : 1000V DC o/p, MAX - 10mA. High voltage Flash tester are useful for measurement of breakdown voltage of electrical components, insulation materials instruments, transformers, etc. can be used to ascertain quality of insulation material before planning their usage in electrical applications. The front panel incorporates all controls for operation of the unit. Easy to use with switch supplied to connect the output high voltage to the device under test. Load : 1000V AC o/p, MAX - 30mA. 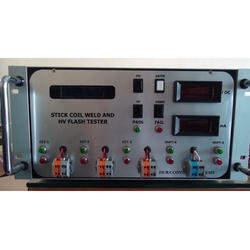 We are presenting a range of coil and joint resistance testing unit for armature coil. The range of our product is definetely good in quality and it has been designed based on the application specification. 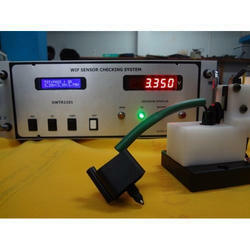 It can measure and test at a range from milliohms and microohms produce an accurate readings. More optimized and it is easy to use. 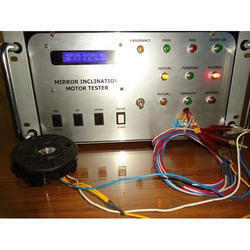 These testing unit are extensively in the market due to their reliablity, accuracy and precision. Best in class industrial grade components and quality.User interface display options both LED and LCD.Easy menu options for settings with password protection.Serial Comminucation RS232 Interface.Its works as standalone or PLC interface for automation. Coil Resistance : Measuring range from 0.1 to 99.99mΩ. Joint Resistance : 0.001 to 9.999μΩ. The water-in filter indicates the presence of water in the fuel such as petrol, diesel etc. it is installed in the fuel filter and when the water level in the water separator reaches the warning level, the water-in filter sends an electrical signal to the equipment. With the help of our quality controllers and highly experienced industry heads, we are able to source the best quality products from our reliable and authentic vendors of the industry. Our vehicle side mirror inspection systems tests the condition of a side mirror before installing in vehicles in automobile industry. It is specially designed for industrial environment and has a high range of accuracy. It shows whether the side mirror is working or not and the angle of rotation.